Facelift surgery is a cosmetic procedure that reverses signs of aging (such as sagging skin and wrinkles) in the lower face and neck. Dr. Calabria has developed revolutionary facelift techniques to avoid the “windswept” appearance and hollowed eyes that can result from traditional facelift surgery. Each patient receives a personalized treatment plan made to meet their goals and produce the most natural-looking and youthful facelift results. The traditional facelift pulls the skin horizontally, which is why it can lead to a “windswept” look. Dr. Calabria avoids this by using a minimally invasive vertical facelift technique. This technique allows the tissues to heal faster and produces more naturally youthful results. A facelift can produce remarkable results, but it doesn’t halt the aging process. Dr. Calabria’s adjustable facelift makes a future facelift procedure much easier and far less invasive than undergoing a full second facelift. The stem cell enhanced facelift restores facial volume using stem cells. Regenerative cells are believed to benefit the rejuvenation process and may help you continue to look youthful over time. Dr. Calabria uses the patient’s own tissue to create “suspenders” that can bear the tension during the procedure. This prevents unfavorable scarring that is common among other surgical techniques in which the tension is along the edges of the skin. 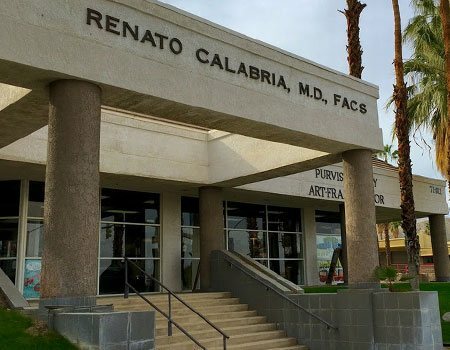 Each of Dr. Calabria’s patients receives a personalized treatment plan made to meet their goals and produce the most natural-looking and youthful facelift results. A “windswept” appearance is one of the most difficult problems to solve. Treatment requires a repositioning of the deep tissues, fat, and cheek muscles in a more vertical direction, which Dr. Calabria can do with a vertical facelift. Old images of the patient in their twenties help Dr. Calabria recreate a more youthful and natural-looking appearance by reverting the anatomy to its original shape. 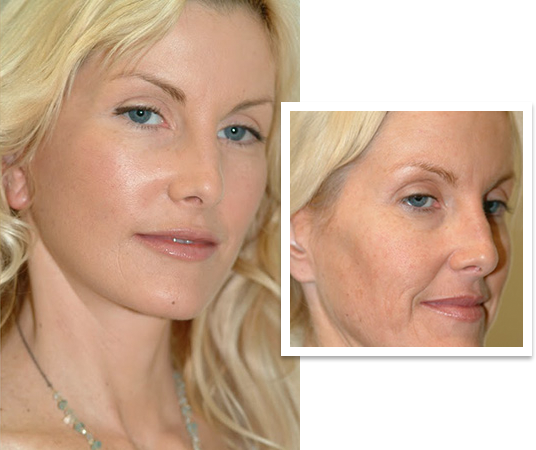 Dr. Calabria also uses micro fat grafting to enhance volume in the cheeks. If patients have hollowed eyes after a previous facelift, Dr. Calabria employs techniques to create a fuller lower eyelid. Dr. Calabria will reposition the orbicularis muscle and fill in the space using micro fat grafting to enhance volume beneath the eyes and create a more natural appearance. Hypertrophic or raised scars can result from excess tension at the incision sites. Dr. Calabria’s suspenders facelift eliminates the tension at the closure lines and can minimize previous scarring. Flattened cheeks lack youthful volume. Dr. Calabria repositions the cheek tissues in a more vertical direction and uses micro fat grafting to add volume to the cheek area. Dr. Calabria can correct signs of forehead aging with an endoscopic brow lift. A brow lift repositions the eyebrows and softens forehead wrinkles. It also enhances the shape of the eyes, making them more almond shaped and open. Q: What areas of the face can benefit from a facelift? A: Facelift surgery benefits the lower face and neck, including the jowls, beneath the chin, and the nasolabial folds (wrinkles around the mouth). A facelift can also lead to some improvement in wrinkles below the eyes, but optimal improvement in this area is accomplished with an eyelid lift. A brow lift may be combined with a facelift to reduce forehead wrinkles and produce a harmonious facial appearance. Q: What are the risks of undergoing facelift surgery? A: The most common complication from a facelift occurs in only one to five percent of all facelift patients. This is a hematoma (a collection of blood under the skin), and it can be removed. Rarely, the facial nerves can be damaged, but in most cases, the nerve injury is temporary and fully recovers after anywhere from a few days to a year. Other rare complications include infection, skin loss, unattractive scarring, and asymmetry. Q: Is a facelift painful? A: General or local anesthesia keeps patients pain-free during the facelift procedure. During recovery, Dr. Calabria prescribes pain medications to help keep you comfortable. Q: How long is the recovery period after a facelift? A: While the recovery period varies based on surgical technique, most patients can resume work and routine activities within two weeks after surgery. The duration and extent of swelling and bruising can differ for everyone, though they typically subside after three weeks. Patients should wait at least three weeks before resuming physical exercise, as exercise increases blood pressure and can prolong swelling. Q: What results can I expect after my facelift? A: Dr. Calabria’s facelift results look very natural and will maintain your unique physical characteristics. Others will notice that you look more youthful, but they will not be able to tell that you’ve had a facelift. The final results can last up to 10 years or longer, though your face will continue to age naturally. Results can last longer if you avoid smoking and use consistent skin protection from the sun.